We report the discovery of a new type of unconventional noncentrosymmetric superconductor, Zr3Ir with Tc=2.2 K, investigated mostly via muon-spin rotation/relaxation (μSR) techniques. Its bulk superconductivity was characterized using magnetic susceptibility, electrical resistivity, and heat capacity measurements. 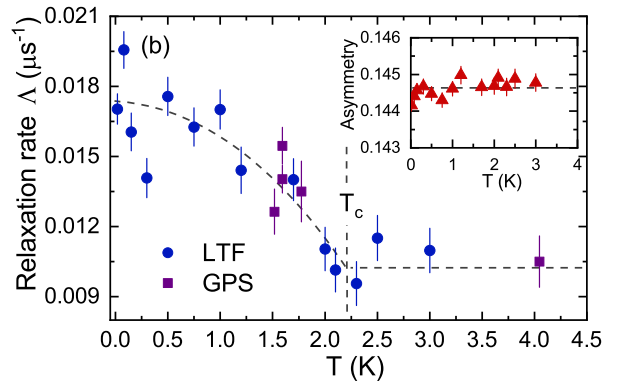 The low-temperature superfluid density, determined via transverse-field μSR and electronic specific heat, suggests a fully-gapped superconducting state. The spontaneous magnetic fields, revealed by zero-field μSR below Tc, indicate the breaking of time-reversal symmetry in Zr3Ir and, hence, the unconventional nature of its superconductivity. Our results suggest that Zr3Ir belongs to a new class of materials, suitable for studying the interplay of gauge-, spatial-inversion-, and time-reversal symmetries.